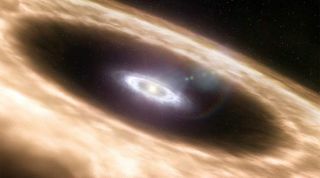 Our solar system is shaped like a thin-crust pizza, with most of the planets traveling around the sun close to the same plane, and it's apparently not alone. A new study suggests the majority of alien planetary systems are much like ours, "flatter than pancakes," scientists say. UCLA astronomers looked at data from NASA's planet-hunting Kepler space telescope and found that more than 85 percent of alien planets have inclinations of less than 3 degrees. This means they orbit around a star near the same axis as other planets in their system. "The best mental image for the geometry of planetary systems is somewhere between a crepe and a pancake," UCLA professor Jean-Luc Margot explained in a statement today (Oct. 15). "I made pancakes this weekend to verify our analogy. I measured a mean thickness of 7.3 mm (a little under one-fourth of an inch) and a mean radius of 65 mm (about 2.5 inches). This corresponds to inclinations of six degrees," Margot said. "So most planetary systems are flatter than pancakes, by about a factor of two." Seven of eight planets in our own solar system have inclinations of less than 3 degrees. The exception, Mercury, is inclined by about 7 degrees in relation to Earth's ecliptic. At the edge of the solar system, the dwarf planet Pluto has an inclination of about 17 degrees, but it is no longer considered a full-fledged planet. "Our solar system may be common compared to other planetary systems in this regard," study researcher Julia Fang, a UCLA graduate student, said in a statement. "Perhaps we're not that special." Since its March 2009 launch, Kepler has detected more than 2,300 possible alien worlds, but recent statistical studies suggest our galaxy likely harbors more than 100 billion exoplanets. The UCLA research has been submitted to the Astrophysical Journal. Researchers presented the study at the annual meeting of the Division for Planetary Sciences of the American Astronomical Society in Reno, Nevada.